Peter Wicks issues a wedding related correction and reports on the latest news about Craig Thomson and Kathy Jackson. 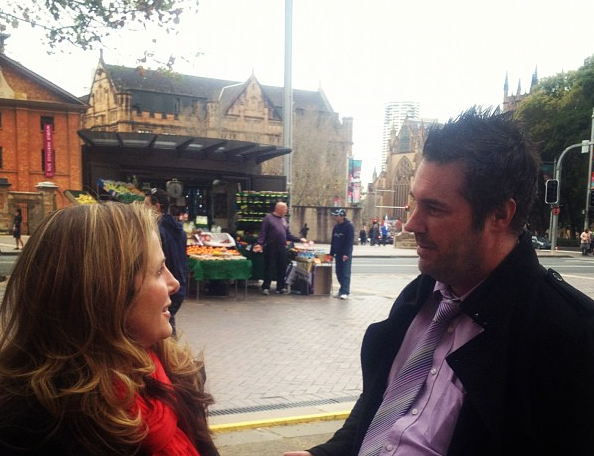 Peter Wicks speaks to Kathy Jackson last year. IT SEEMS I need to put out a correction to something I have mentioned in a couple of my previous posts, something I wish other people reporting on events had enough decency and respect for their readers to do. Well, maybe it’s more of an update than a correction. I have mentioned in several of my posts that Kathy Jackson and Michael Lawler were jetting off to the U.S. in early May to tie the knot, then enjoying a two month European honeymoon. Married bliss was awaiting them while the criminal investigations into Kathy’s behaviour whilst at the HSU underway in Victoria awaited their return. Sources close to Kathy have now said that is not the case and my own investigations have shown that Michael Lawler is indeed still in Australia. It has been reported to Wixxyleaks that the wedding has been postponed, however it is not known for how long as yet, or even if it is permanently postponed. Over the last couple of weeks, there were rumours circulating that Kathy Jackson was indeed wearing white, however not in a bridal sense. The rumours that came from various circles were that Jackson was in a psychiatric facility undergoing treatment. I did not share these rumours, as last time Jackson was alleged to be in psychiatric care the flowers that were sent to her by her union branch were apparently returned by the hospital because, they said, she wasn’t a patient. Fair to say, I am sceptical. I cannot confirm the rumour regarding the psychiatric facility, however sources allege Jackson is on heavy medication. Kathy’s only official role currently is as the National Secretary of the HSU, and she has not shown up for any meetings since July last year. She is currently on extended leave from her HSU role — quite extended it would seem. As for Craig Thomson, it has emerged that Thomson plans to stand in the next Federal election as an Independent. Thomson is clearly confident that he will be cleared in court come June, or else he would not be running at all. Questions raised by Senator George Brandis over his standing while awaiting an appearance in criminal court to answer charges are utterly ridiculous. The election is in September, while the court appearance is in June. Last time that I checked, June came before September, so voters will have around three months to make up their mind after Thomson’s court appearance. My tip would be that if he is found guilty, he won’t be standing, so the fuss will be for nothing. Also seemingly ridiculous are reports that Thomson did not decide to run as an Independent himself and that the ALP would not endorse him. Thomson has been an Independent for many months now and if Labor wanted a different candidate they would have pre-selected well before now, I would have thought. Instead, there is still no Labor candidate for the seat of Dobell. I think that tells the real story. As usual, I will keep you posted as to the goings on in Jacksonville, as there is always something of interest going on. I should also add, in all sincerity, that if Kathy Jackson is indeed unwell, I wish her a speedy recovery and hope she feels better soon.